Note : Your request will be directed to Sigatek. 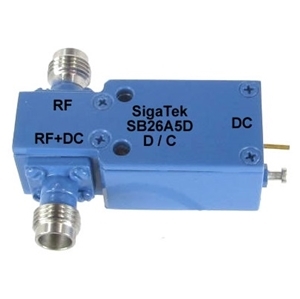 The SB26A5D from SigaTek is a Bias Tee that operates from 30 kHz to 85 GHz. It has an insertion loss of under 4 dB, an isolation of over 25 dB and a VSWR of 2.50:1. The Bias Tee can handle an input current of up to 0.5 A and max DC levels of 25 V DC. It is available in a module with 1.85 mm female connectors.